Since the publication of Writing Degree Zero in 1953, Roland Barthes has been creating a body of criticism that alters in an absolute sense our traditional notion of what literature--and indeed what writing itself--is. As a semiologist--a practitioner of the science of signs and symbols--he stands outside language and outside meaning to pick out the codes of which they are composed. He has always been difficult, but his style has become increasingly quirky and self-absorbed over the years. The theme which unites the three writers he is examining here is that all are "Logothetes," or founders of languages; and it may be fairly said that Barthes himself is bucking for that status. Although these pieces were originally published separately, they were intended to join each other in a book. The modus operandi of his critique of the evil writer, the great utopian and the Jesuit saint is to strip each of his social context and hortatory intention. Each is isolated into the system that is the Text, the Barthes ideal. The effect is to make them ludicrous and lovable by exposing the dependency of their ideas, their world, on words and rhetorical structures. Under Barthes' ultra-violet scrutiny, they are charming fiddlers. There are actually two pieces on Sade, which frame the meditations on Fourier and Loyola, and these comprise the liveliest discourses. 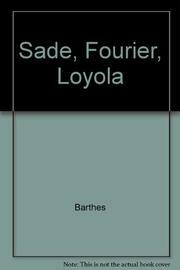 Sade, the libertine, also provides more "readerly" pleasure--Barthes' criterion of excellence and apparently also his own goal, since he skips along merrily from one apercu to the next like a man jotting down his dreams the morning after. Not everyone will be willing to trip after him, but this perversely poetic critic does generate a great deal of electricity.